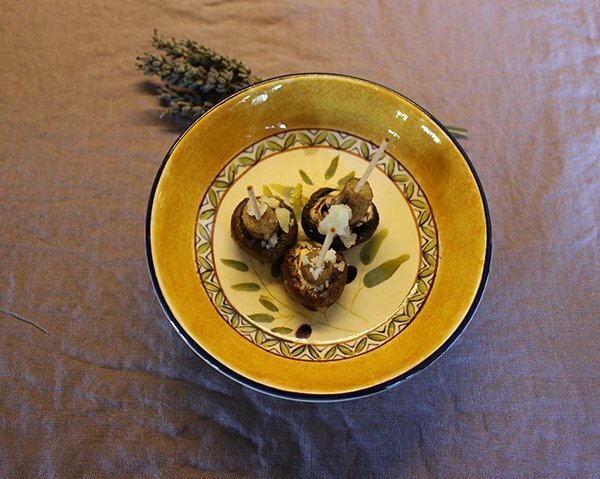 This recipe boosts the normal umami of mushrooms by adding a layer of savory lavender flavor. When most people think of lavender, they think of a highly floral, semi-sweet flavor. But some lavenders, particularly the oil-rich hybrids of English and Portuguese lavenders, are far more herbal and savory. This recipe uses two, atypical flavors: the Monte-Bellaria Culinary Lavender Herbed Salt and Monte-Bellaria’s very green, early-harvest olive oil. Of course to achieve the best results you need the freshest mushrooms available. Check whole button mushrooms (either white or brown) to make sure they are tightly closed (no gap between the stem and cap). 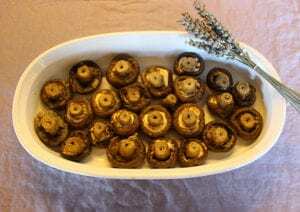 Another important tip is that you should NOT wash these mushrooms; use a moistened paper towel and lightly clean them—otherwise the oil and herbs will not adhere correctly and will produce too much liquid in the roasting. Clean mushrooms with a moistened paper towel and cut off a tiny piece of the end of the stem. Place mushrooms in a plastic zip bag along with the olive oil, garlic and herbed salt. Line a baking sheet with foil and lightly oil. Place mushrooms, round cap down on the sheet and space so that they aren’t touching. Lightly drizzle another teaspoon of the olive oil over the mushrooms. Can be made ahead of time and lightly re-heated. Like many dishes that have the chance to mélange overnight…it’s much better on day two! While hot, dust tops of roasted mushrooms with grated Parmesan cheese and insert toothpick. Can be served at room temperature.